VisualRoute 2009 is available in several specialized editions, including options for on-demand and continuous connectivity analysis, and 2-way connection testing to/from remote customer desktops or multiple points on a global network. Try the online connection test. Results from several essential network diagnostic tools are integrated into an overall connectivity report, providing a graphical view of connection performance report including packet loss and latency for each network hop. Drill-down detail is easily visible with a mouse over any network hop. The physical geographical locations of network servers and routers is key information for understanding routing problems, viewing the actual route path on global map provides an instant of picture of routing efficiency and distances. Try an IP trace online. Get instant lookups of domain information from worldwide databases, so you can see the registered ‘owner�?of an IP address or domain. See the contact information for the company providing Internet access for each hop of a network route, so you can easily report network problems. Get real-time views of all possible routes to a destination and easily compare the performance of different routes. The common use of load-balancers creates multiple paths that data packets may travel between the source and destination. OmniPath discovers the various paths, enables you to easily see which routes are the fastest/slowest, have the highest/lowest packet loss, or have the highest probability. OmniPath performs multiple route discovery and displays all paths to a network destination, reports the performance for each individual route. OmniPath is a feature of the Business and SupportPro editions. Today's common use of load-balancers creates multiple paths that data packets may travel between the source and destination. The standard VisualRoute report shows a single path taken by the packets on that particular test. However, in many cases this does not provide complete picture of network route as there may be many possible paths due to the use of load balancers. OmniPath discovers the various paths, enables you to easily see which routes are the fastest/slowest, have the highest/lowest packet loss, or have the highest probability. Each column of dots represents the various paths that data packets may follow from the starting point (your computer or a Visualware server location) to the end location. The color of the node circle represents amount of packet loss, a green circle indicates little or no packet loss and minimal latency. A mouse-over any node circle will provide performance detail for that hop, as shown in the white box above the fifth hop in the diagram above. See the NetVu information for additional reporting of multiple IP paths and network performance. NetVudiagrams all paths to multiple network destinations. NetVu is a feature of the Business and SupportPro editions. NetVu shows high-level view of all network routes for open trace reports, and enables you to easily identify network nodes that are common to multiple routes, and view network routes that have multiple path options determined by load balancers or router configurations. NetVu automatically generates an accurate network topology of public and/or private network routes, identifies critical points of failure caused when multiple routes share common routing devices, identifies traffic balancing devices, and shows all logical and physical paths to traced destinations. By seeing multiple networks in a single diagram, NetVu helps you to consistently monitor network routes and locate single points of failure. The diagram updates whenever a new trace is performed, when used with the continuous trace option you can easily check the health of your network by viewing changes in the routing diagram. A mouse-over any node circle will provide performance detail for that hop, including average response time in milliseconds, the minimum and maximum response time in milliseconds and the packet loss percentage. A click on one of the nodes will highlight in blue every current route that passes through that node, as shown above. The flame symbol in the image above indicates that a firewall could be blocking VisualRoute's ICMP/UDP packets. See the OmniPath information for additional reporting of multiple IP paths and connection performance. See a high-level view of all network routes for open trace reports, enabling easily identification of network nodes that are common to multiple routes, and network routes that have multiple path options due to load balancers or router configurations. NetVu enables you to consistently monitor all possible paths between the source and destination for mutiple routes in a single diagram, view the common nodes, and locate single points of failure. The diagram updates wheneven a new trace is performed, when used with the continuous trace option you can easily check the health of your network by viewing changes in the diagram. Trace specific application ports to test if your critical applications are up and responding as expected. 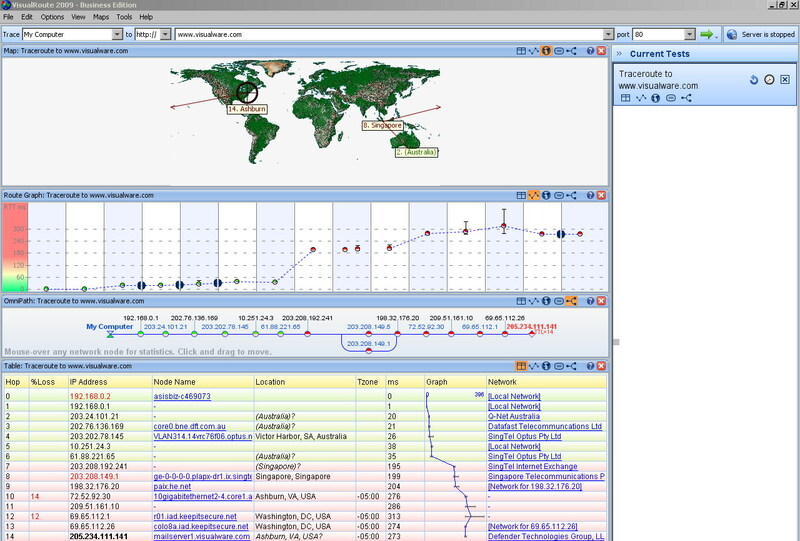 VisualRoute measures and reports on DNS (domain name service) response time, which can have a significant effect on connectivity performance. Test from Visualware servers in Washington and London to test connectivity to your servers or network devices. This capability provides additional testing points to help identify network routes and network providers causing poor performance. Try a traceroute test now. Continuous network testing from the VisualRoute desktop to another network location supports automated cycling of connectivity tests to monitor performance degradation that may occur over long periods of time. The SupportPro Edition enables support staff to test connectivity in both directions: to/from the VisualRoute desktop and to/from remote systems. This capability provides visibility to connectivity problems that occur in one direction only, such as from the customer location to your server -- problems that are otherwise very difficult to pinpoint without imposing on the customer or traveling to the remote location. 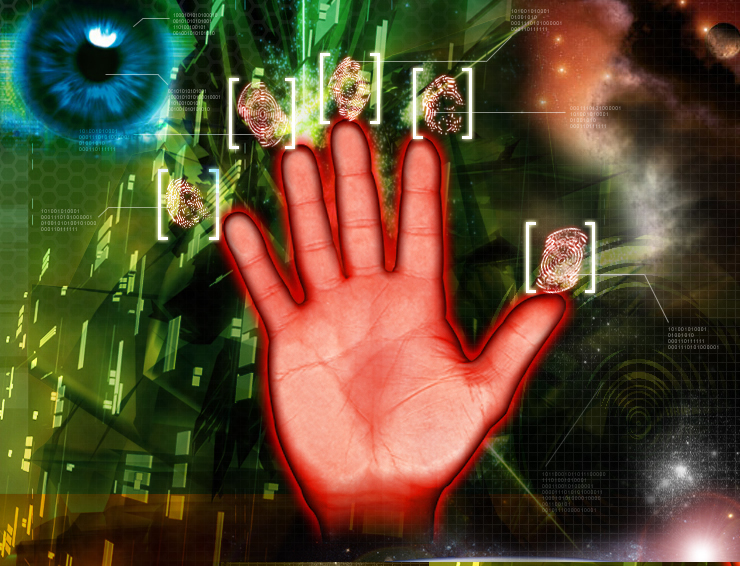 The SupportPro Edition utilizes remote agents to make reverse tracing a quick and easy process. IPv6 is the next generation of the Internet Protocol, the system by which data is transferred across the Internet. VisualRoute 2009 enables traces to IPv6 addresses, including IPv6 domain and network provider lookups. VisualRoute 2009 is IPv6 compatible. IPv6 is the next generation of the Internet Protocol, the system by which data is transferred across the Internet. The primary problem that IPv6 solves is the shortage of IP addresses, which are becoming scarce due to the number of systems connected to the Internet. In the coming years the Internet will gradually move over to IPv6, with a transition period in which both IPv4 and IPv6 are in use. VisualRoute 2008 traces IPv6 addresses and provides the full reporting as with IPv4 traces. To trace IPv6 addresses from your own desktop requires an Internet connection from an IPv6-enabled ISP (Internet service provider) �?you cannot trace IPv6 addresses if your ISP supports only IPv4 traffic. In addition, to make use of your ISP‘s IPv6 features, your computer must have an IPv6 stack installed. Most modern operating systems such as Windows Vista have this preinstalled. IPv6 addresses are much longer than traditional IPv4 addresses - an example of a IPv6 address is 2001:4860:0000:0000:0000:0000:0000:0000 (versus an IPv4 address such as 205.234.111.204). A VisualRoute trace to this IPv6 address is shown below. The VisualRoute Personal through SupportPro Editions are available in a single download with a 15-day trial period which enables you to test the software prior to purchase. Just download, install and run to start the trial period, you can select an edition to try at any time during the 15 days. If you have any questions about installing or implementing the software for your requirements, please contact Support. Once a product license has been purchased, simply run the product and apply the product license key provided to you by email. VisualRoute Server is now MCS MyRoute.